YASKAWA announce new certifications for their U1000 Matrix Drive for marine installations including NK, BV, DNV/GL, ABS, LR and KR. This innovative technology controls the motor load by directly converting AC input voltage to AC output voltage and offers many advantages compared to conventional AC drive design, where the power conversion is AC to DC to AC. A key advantage of this Matrix technology design is that it eliminates the need for a rectifying circuit and DC smoothing circuit typically found in conventional Voltage Source Inverter (VSI) drive systems. 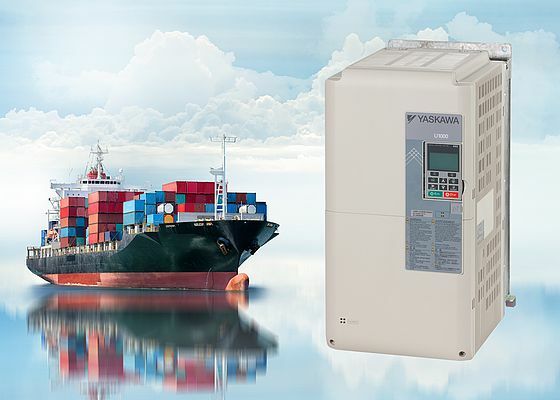 Where marine applications demand optimum efficiency and reliability the U1000 is an ideal solution to ensuring power quality, energy savings and system efficiency. With a conventional VSI drive there is a need for heavy filtering to avoid input harmonic distortion (THDi) and to keep the IEEE 519 limits within harmonic guidelines. A drive without any external filtering can result in high input current distortion (THDi) ≈ 88%. Whilst this will keep the input current harmonic level below 10% it does require an additional 12 pulse input transformer and a 12 pulse ready drive. This phase shifting solution improves the harmonics compared to a conventional drive solution, but it is large and cumbersome. Furthermore, it does not offer the same space and weight saving performance as the YASKAWA U1000 solution, which is a simple 3 wire in / 3 wire out, compact installation. The U1000 Matrix technology reduces THDi to 5% without the need for external transformers or filters and its low harmonic performance results in near sinusoidal input current waveform that reduces energy losses on the system power supply.